The very kind people at Quality Candy sent me a giant box of samples to review. When we unpacked this candy sample we knew it would be the first thing we would try. If you haven't read some of my other reviews, I'll let you know....I'm a big fan of citrus type fruits in candy. Lemon is one of my favorites. I didn't know much about Quality Candy before they sent me this box of candy, so I thought the least I could do was to educate myself about this company. One thing I noticed right away from visiting their website is the Gilliam brand that they sell. I've seen these old fashioned hard stick candies in lots of stores and I've probably eaten a few hundred in my lifetime. 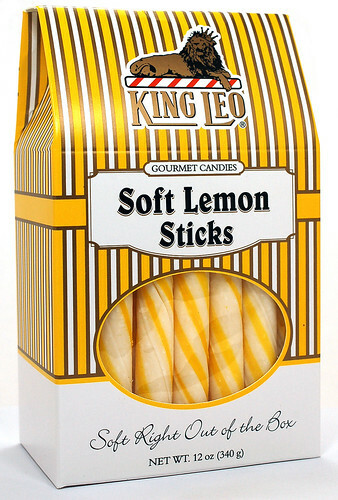 I hadn't heard of or seen their King Leo brand before, so I'm wondering if it's a regional candy, I'm not quite sure. I am sure though that everything they sent from the King Leo line looks fantastic and I'm looking forward to reviewing more of this candy. The first thing I always notice is packaging. This gable box is simple, elegant and has a slightly retro or old fashioned look to it. I love the King Leo mascot perched on top of a peppermint stick, which is their signature candy. The quote on the bottom of the box is that these candies are "Soft Right Out of the Box". I will wholeheartedly agree with that statement. This is a condensed or compressed sugar stick with lines of lemon flavoring wrapped around it. These are definitely nice and soft as they fall apart when your teeth crunch down on them. The lemon flavor isn't sour or something that will make you pucker. Its a really nice mild lemon flavor that reminds me of a slightly tart melted lemon drop if it were wrapped around a sugar stick. The nice thing about this candy is that it isn't lemon all the time. There's just enough flavoring for you to taste lemon but it is balanced by lots of sugar. As my wife said to me, "Who wouldn't want to eat a dozen of these?" I'm not not sure who would want fewer than a dozen. They are just really pleasant and different from other candies. What does someone do with free candy besides eat it? Well, you play with it, of course. 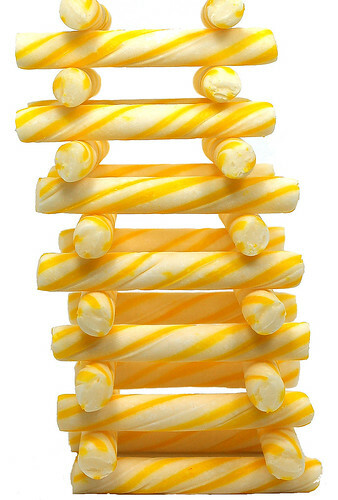 The round sugar sticks reminded me of Lincoln Logs, so I spent waaaaaaaayyyyyyyyyyy too much time putting a tower together. I'm not very happy with my pictures, but I don't have the photography setup I need to make this candy look as good as it tastes. There are some very nice professional photos on their website, I recommend you check them out.